In the course of my investigations of my small cell hives on VSH (Varroa Sensitive Hygiene), stimulated by Erik Österlund, I now came across very interesting facts that take place in the bee brood and especially in the drone brood. IIt is well known in small cell hives that the Varroa mites go in the active season especially in the drone brood. This is more pronounced than in conventional large cell colonies, which has already been confirmed years ago by my investigations in my small cell hives. Now I already noticed for some time that drone brood cells and also worker brood cells could be occupied by several Varroa mites, although the number of Varroa mites in the hive was rather low. I did not have an explanation, only assumptions that the inbreeding of the mites would be avoided if there are more than one mite in one brood cell. Now I learned that this was not correct and the assumption that this is controlled by the bees cannot be contradicted anymore. 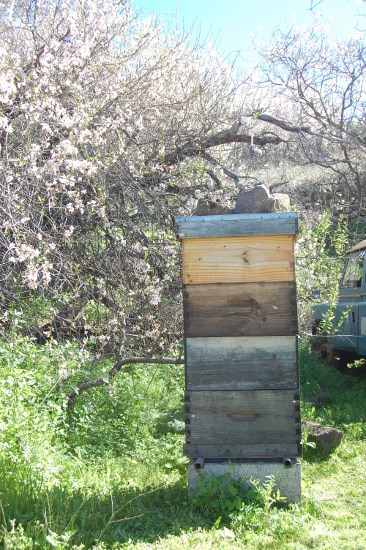 I examined recently a very strong hive N ° 3R, which went through the winter on 4 supers and now, at the beginning of February in the almond blossom, already has four brood frames in the second box and two brood frames in the third box. 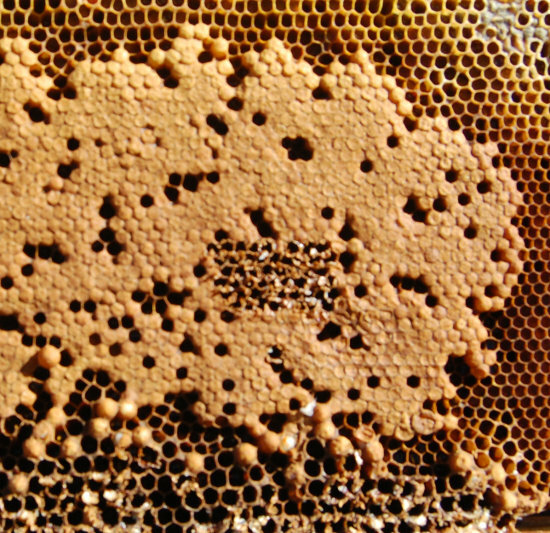 A fully occupied brood comb (Langstroth) of small cell bees has about 7000 brood cells (with large cell only 5500). First, I opened capped worker brood cells with pupae with purple eyes, as Erik Österlund proposes in the VSH test. After 50 cells I gave up because I found no Varroa mite in the cells. 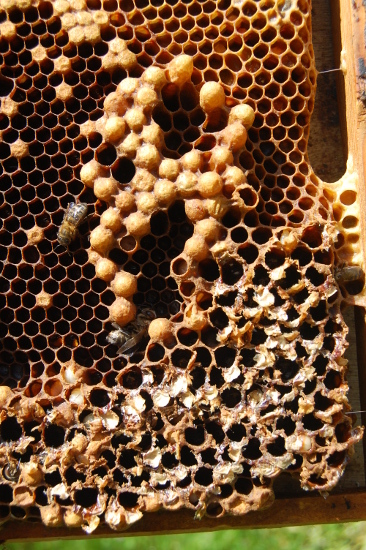 However, I saw on this comb 2 brood cells opened by the bees through the hygienic behavior and the holes in the caped brood comb testify some cleaned bee brood cells. In these two opened bee brood cells I found in one a Varroa mite, with also a female offspring and the other had a dead Varroa. Now came the interesting aspect, the drone brood. two cells with three Varroa mites and 3 female offspring each. And in these cells the brood of Varroa mites is interrupted, which is in itself a significant advantage for these small cell bees. I watch this hygienic behavior constantly in the drone brood in my small cell hives. But now comes the interesting part. I opened a total of 86 drone brood cells with pupae with purple eyes, which does not happen so often that one has the opportunity to find this so concentrated. 2 cells, with one Varroa mite and only one male offspring each. This means that these 10 Varroa mites do not propagate. This means that I found a total of 51 Varroa mites in 86 drone brood cells and only 37 female offspring. That’s amaizing and you can calculate that the Varroa mites do not represent any more danger to this hive. The Varroa mites focus on the drone brood and those who nevertheless go to the worker brood are allayed. Now the astonishing thing is the multiple occupation of some drone brood cells by up to 5 Varroa mites. The more Varroa mites that are in one cell, less female offspring arise per mite. So if you think logically, then the mites would have to split between the existing drone brood cells to proliferate themselves optimally. But they do not do it. So the assumption appears that multiple occupation is controlled by the bees. This is an assumption that we need to verify by further studies. Further and extremely interesting observations of how small-cell bees defend on their own against Varroa mites. This second study shows how fast small cell bees can get the Varroa problem under control, if we give them the necessary prerequisites. Now I have re-examined after one month exactly the same hive. Here you can see the first investigation. It was very windy for 2 weeks and the bees could fly less. However, the hive had large food reserves, so the breeding continued without any break. I examined exactly the same comb as the last time. In the worker brood I found some open cells by the hygienic behavior. In 40 opened worker brood cells I found no Varroamite. This means that these 18 Varroa mites do not propagate and that the VSH now makes its appearance. This means that I found a total of 38 Varroa mites in the 86 drone brood cells and only 14 female offspring. Of these 38 Varroa mites there were 14 that did not lay eggs or were dead. The multiple occupation of Varroa mites in drone brood cells, that I found last time, now increased to 8 in a cell and above all they did not lay eggs at all. It was written early on in the 1980s that researchers were able to show that mite reproduction hinges on the physiological condition of infested honeybee larvae inside a bee cell. Thus, the juvenile hormone titer in the blood of the honeybee prepupa dictates whether the female mite initiates egg laying after the first blood meal. In the Western honeybee, A. mellifera, the blood of both the drone and worker larvae has a relatively high juvenile hormone titer at the time when the cell of the developing larva is capped. In the Esern honey bee, A. cerana, the worker larva has a relatively low hormone titer in the blood at the period of cell capping which is also the period for mite entry into the cell. Since the drone prepupa of A. cerana, however, has its highest blood hormone level at this period, the mite selects it as its host. 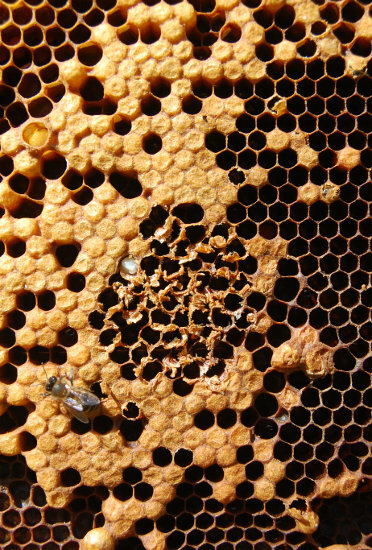 Now since our European bees for the most part are on artificially enlarged foundation, reducing the foundation to the size equivalent for A. cerana and also original size of feral European races of bees, this step then drastically reduces mites from entering and reproducing in our domesticated european honeybees worker cells, just like with A. cerana worker cells. And above all the level of JGH in the bee puppae will be reduced by the blood sucking of so many mites, so that the Varroa mites have no more incentive to lay eggs. 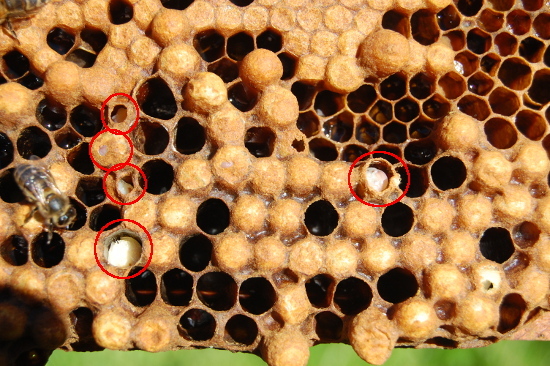 Why ever several Varroa mites go into the same drone brood cell, although it is clear that they can not multiply there?